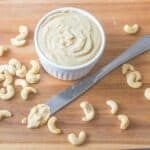 Cashew nut butter – go crazy for this easy to make delicious nut butter recipe that’s cheaper and healthier than the store brought kind. While I was out and about on my lunch break I visited my local health food store. I’m fortunate enough to be situated by a busy town centre, where I have access to an abundance of stores, a shopaholics nightmare. Thankfully I’m not a shopaholic, a food-a-holic – indeed that I am. I went to the health store to replenish some household items – shredded coconut, medjool dates, sunflower seeds and some cashews. I’m completely nuts about nuts but not their extortionate price. My favourite nuts are Cashews and Macadamia – both are relatively costly. My thoughts soon turned to the upcoming recipes I was hoping to make using cashews. Noone likes to waste money, especially hard earned cash on expensive items, that’s usually my line of thinking. Given the price of cashews and my trial and error in baking, just like every other cook, I decided to try my luck with purchasing some nuts to make cashew butter. Cashew are nutty and sweet in taste, well at least they are in my humble opinion. The results from making cashew butter were astounding, it’s definitely featured on my hit list. I made the nut butter using my trusty high speed blender (Vitamix), similarly there’s the option of whipping the nuts using a food processor, although this is timely and I’m not sure if the motor could handle the duration of time it takes to yield results. Having said that, I have seen many impressive results using a food processor, sadly the length of time it takes is less appealing. In essence a robust piece of equipment such as a vitamix, ninja or even a nut butter grinder such as a stone grinder is highly recommended. I feel that is very much a subjective matter. It all depends on how patient you are with making nut butter, I personally like to add up 1/4 cup of coconut oil to make nut butter just to make the process quicker. It makes less than 3 minutes to whip up cashew butter using my vitamix with oil. However, if you don’t want to add oil, that’s fine. 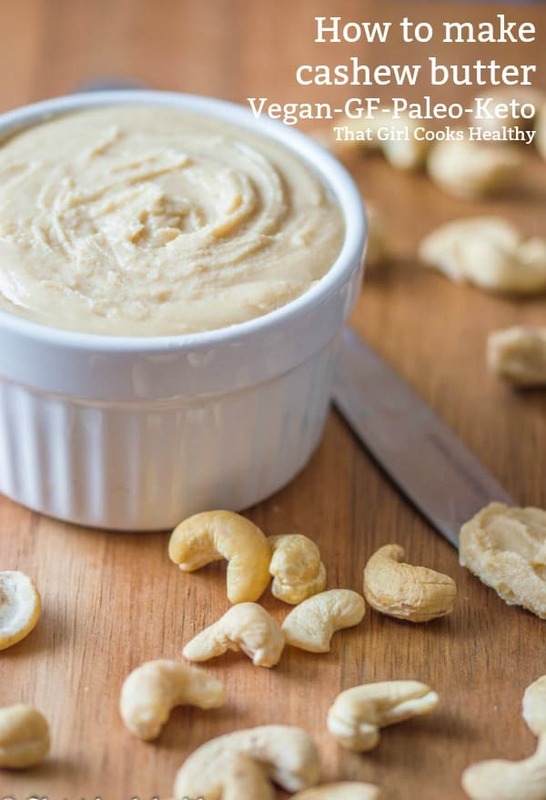 It will take a little longer to make some creamy cashew butter, roughly 10-15 minutes. Just keep scraping how the sides of the blender at times and be patient. The Vitamix is a powerful, sturdy machine so needless to say it can handle a bit of chugging with some rough and rumble. I honestly believe it was made with that in mind. 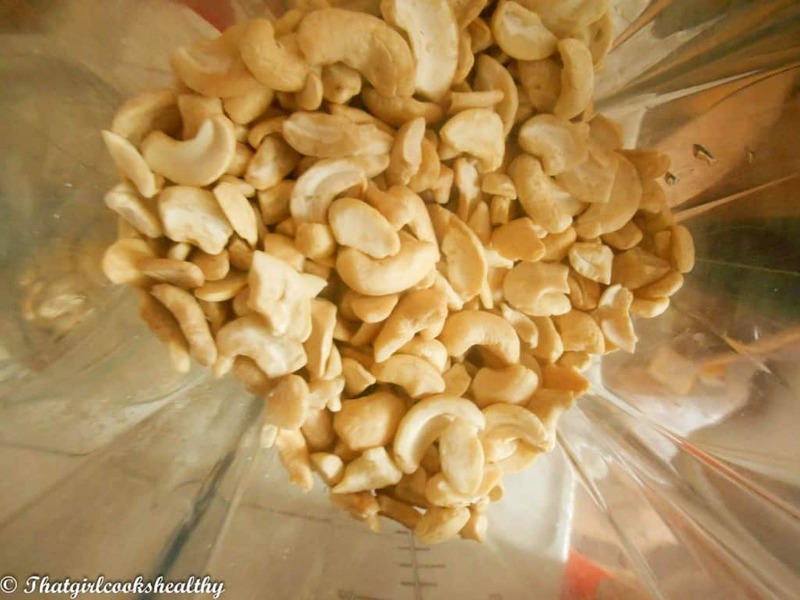 The quantity used – I used 500g of cashews to make the butter; poured the nuts into the container, switched the machine from variable to high speed and used the tamper to push the cashew nuts onto the blade. It’s so important to use plenty of nuts in order to see the best results, the Vitamix needs something to grab onto and breakdown in large quantities during processing. The nut butter stage – After a minute or so the nut butter should form, what you’ll be left with is pure heaven in a large container. Thick, creamy and highly additive butter. Keep in mind the texture is on the thicker side as cashew don’t extract oils like peanuts. You’d need a stone grinder for the nut butter to resemblance that ultra thin, creamy texture which is seen in stores nationwide. The nutritional properties in raw cashew butter are unreal, they might be on the calorie dense side, yet they are packed with a bunch of minerals. Selenium, copper and zinc are crucial co factors for enzymes. Enzymes are a very important aspect of digestion, helping to breakdown the food we eat. Vitamin B5, B6 and B1 assist the cell structure and play a vital role in the metabolism of protein, fats and carbohydrates. Another interesting fact about cashews is the soluble fibre (great for bowel movement) and phyto chemicals which protect against disease and various cancers. The fats in cashew are a complete contrast the to trans fats which run rampant on supermarket shelves. Monounsaturated fats are what I like to call “friendly fats” that help to lower the low density lipoprotein (LDL) also known as the “bad fats” which attribute to cardiovascular disease. The “friendly fats” lower these “bad fats” keeping our heart fit and healthy. 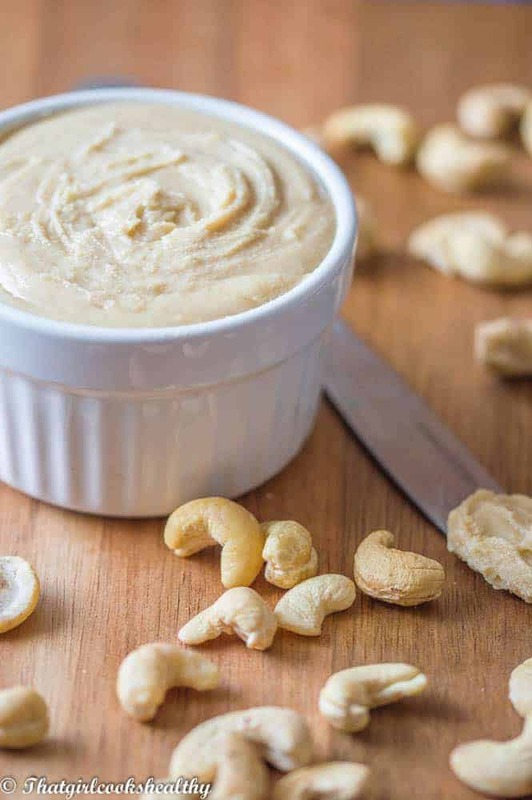 Learn how to make your very own healthy homemade cashew butter from scratch in a vitamix. Pour the cashew nuts into the large container along with the coconut oil (if adding it) and secure the lid. Switch on the machine and slowly increase the dial to variable 10 then to high. Insert the tamper and push the cashews down onto the blades. At this stage the machine will start to make a loud noise whilst converting the whole cashew into butter. If no coconut oil is added the entire process can take roughly 10-15 minutes so be patient and scrape down the sides of the blender frequently. Store in a air tight container or freeze for longevity. Feel free to add a tbsp or two of coconut oil if experiencing difficulty with pureeing the nuts. High speed blender like a Vitamix or Blendtec is recommended. I LOVE Cashew Butter!!!! This recipe is spot on and it looks so good and creamy :). Thanks Jessica, yes it is VERY addictive and tasty. 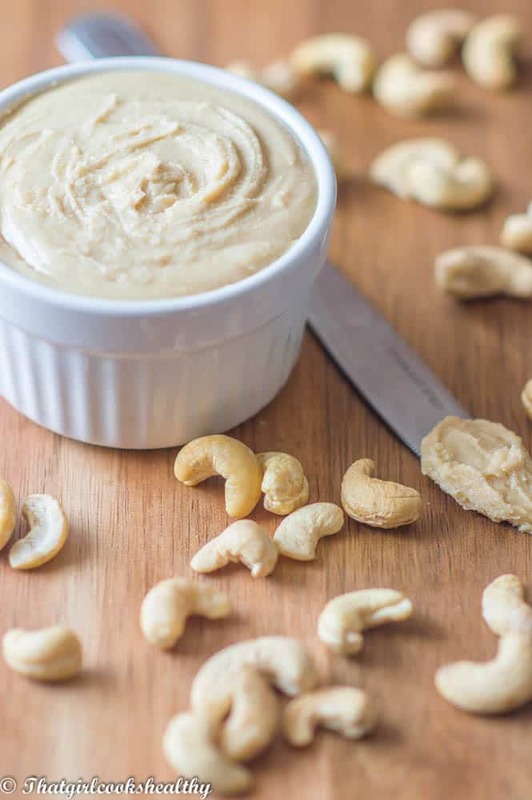 Cashew butter is my favourite kind of nut butter! I’m in love with homemade cashew butter right now. I can say from experience that a good food processor will definitely get you that creamy smooth texture without adding anything, it just takes a good 10-15 minutes of spinning to get there. You can always take a break in between to let the motor (and butter) cool. You might also have to break up the cashew ball that forms during the pre-butter stage, but if you stick with it the texture is incredible. Hi David, thanks for commenting. Agreed! You can definitely make cashew butter in the food processor albeit it takes a while to achieve the results. Hi, can we use olive oil instead of coconut oil? Yes, any oil works well with this recipe.